Seascape has recently a new (high) pressure testing service for rent. We have developed a large tank (max. 32 bar) and a small tank (max. 400 bar). Objects/devices and cables can be tested in these tanks. 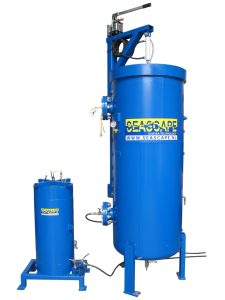 Both pressure tanks have electrical connections that can be used for monitoring or controlling the equipment during pressurization. A standard test procedure takes 2 hours. We have different price setup for extended pressure test time. Top loading of objects with forklift. Ø 325 mm ID x 610 mm effective working height or ø 145 mm ID x 710 mm. 3 electrical connections. (4 pin, 6 pin, 12 pin). Live monitoring and control of objects during pressure test; object electrical / data connected to outside tank monitoring. Live camera view of object under pressure. Calibration of pressure sensors to standard 20 bar (0.05% FS). Optional higher pressures.